Reality television frequently portrays a modified and highly influenced form of reality, utilizing sensationalism to attract viewers and so to generate advertising profits. Participants are often placed in exotic locations or abnormal situations, and are sometimes coached to act in specific scripted ways by off-screen “story editors” or “segment producers,” with the portrayal of events and speech manipulated and contrived to create an illusion of reality through editing and other post-production techniques. – Apparition During Press Conference? The visionaries are exposed or expose themselves to an enormous pressure from the media and the pilgrims who desire to meet and touch them before, during and after the so-called apparitions of the “Gospa”. They ignored and are still ignoring the professional warnings and recommendations signed by an international team of three medical doctors and two pastoral psychiatrists and sent to the Bishop of Mostar, to Frs. 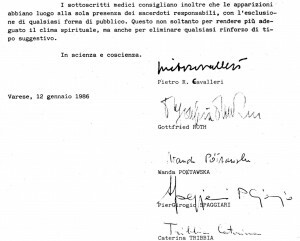 Slavko Barbaric and Tomislav Vlasic, to the Prefect of the CDF, Cardinal Joseph Ratzinger, and to Pope John-Paul II, in 1986. It is unfortunate that Fr. René Laurentin, who has a peculiar sense of ethical conduct, publicized and discussed a part of the confidential investigation that accompanied the recommendations. A priest and pastor should know that the confidentiality of an intimate clinical and diagnostic psychiatric evaluation ought to be respected. However, the faithful who are surprised by the “reality shows” that these so-called ecstasies and apparitions have become should be informed of the general pastoral recommendations submitted, 25 years ago, by the said team of competent professionals to the religious authorities. 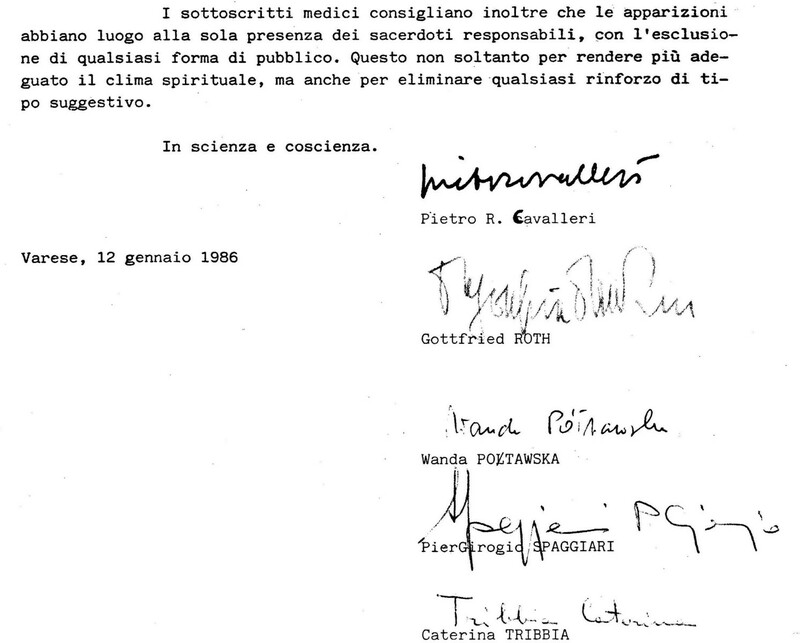 Here is the last paragraph of two pages written in Italian and undersigned by Austrian Prof. Gottfried Roth, neurologist and pastoral psychiatrist (deceased in 2006), Polish Prof. Wanda Poltawska, pastoral psychiatrist and intimate friend of Karol Wojtyla/Pope John-Paul II, Italian psychiatrist Pietro R. Cavalleri and Italian medical doctors Caterina Tribbia and PierGiorgio Spaggiari. At the time of those recommendations, 4½ years after the beginning of the events in Medjugorje, the experts observed that the visionaries were subjected to an enormous psychological pressure from the pilgrims who were searching for a direct contact with them. They feared for their psycho-physical integrity and expressed their great preoccupation that the lack of reserve or discretion surrounding these exceptional circumstances could corrupt the spontaneity of the phenomena under scrutiny for the determination of their supernatural origin. The psychiatrists have noticed these risks. It is true that these seers sustain, without protection, risks of deterioration from which it would be advantageous to protect them. But who does not assume risks in some way? The inquisitions of the doctors, and even more so of the psychiatrists, are more traumatic to the seers than the ordinary visitors. Even more difficult, would be the inquisitors of the Theological Commission. Do not accept the idea of an opposition between faith and science: that frame of mind originates only from a lack of understanding of their respective methods. […] Give it a lot of thought with your bishops, your chaplains, your associations in order to develop a pastoral care of intelligence that will overcome that dichotomy. Without the collaboration of the parochial pastoral personnel, the Bishop of Mostar could not implement the said pastoral care of intelligence. According to Mgr. Pavao Zanic, Fr. Tomislav Vlasic was fabricating the Lady of Medjugorje’s so-called messages. It seems that Fr. Vlasic’s appeal and Fr. Laurentin’s influence have been successful to date. According to Cardinal Puljic, the “doctrinal issue of the Medjugorje phenomenon is resolved”. Let’s be confident that it is in the spirit of the 1978 Norms! That inquiry appropriately accomplished, is it not time to move towards “depth Mariology”, with a zest of intelligence in pastoral care? Our sincere hope: Benedict XVI is apparently keeping an eye on those things! Thanks again Louis! May God bless you abundantly! Thank you for your posts Mr. Belanger. Now that the Commission is at work in the Vatican, and the time is drawing to a close for the visionaries, I see a big RED FLAG out there with what appears to be a stepped up public relations campaign by the supporters and the “seerers” going about and rousing up emotions and preparing the naive to experience resentment and even disobedience to the Church in favor of the phenomenon. The formation of a climate of emotion of the masses will be a HUGE problem for the Church when the results are complete. Seens more like the old red devil to me. One could say there is parallel in how Communion in the hand was permitted after it was illicitly allowed and masses of Catholics got used to it. I hope this is not the outcome. We have so much division in the Church right now with unabashed disobedience to the Church on the part of Bishops as well as priests and laity that this could cause a schism if the Church declares or confirms the local bishops’ commission declaration is correct. Reading the documents provided by good bloggers and others certainly leaves no doubt that the study in Rome won’t find it difficult to draw a conclusion, but I think its prinary focus is on the pastoral problem and the people behind the pheomenon clearly know that. Hopefully these promotion tours, reality shows and news conferences that the Queen iof Heaven and earth “is busy attending” (ahem!) may in the end just blow up in their faces and show up the whole thing for what it really is. On a day excursion to Mostar last year, we passed signs for Medjugorje along the way. (I was visiting Croatia’s Dalmatian coast as part of a group tour) I had no interest at the time; I had more than enough of my fill of visiting the beautiful churches. Praying before the Blessed Sacrament was all the miracle I needed! Later I read in a book of Croatia history that after the 1st apparition occurred, the Communist government jailed the parish priest for 3 1/2 years and police were sent to seal off the town to outside visitors for nearly the same amount of time. Of course money eventually got the best of them so the town reopened. This investigation by the Vatican is long overdue!! If this is supposed to be some offering of logical Catholic reasoning by a shepherd over the faithful it is truly lacking in its reasoning and explanation. After stating that these faithful are “devout Catholics” he continues with a non-sequitur that infers that “devout Catholics” somehow lack “reverence for the Eucharist”. That may keep one’s pride of position in a politically correct state, but I much prefer those shepherds who show more respect for such faithful by not withholding the sacrament from them while denying their legal right to celebrate because they have as well a devotion to a permitted place of pilgrimage within the Church’s own instructions. Let’s face it … some shepherds are courageous in their service to the faithful and others are timid! The mass is not something to be withheld from “devout” faithful as some type of instrument of opinion or to imply some association of same to a completely other topic outside of its parameters. Otherwise by doing so the bishop himself goes beyond the ongoing examination by implying to the public that there is already some kind of negative decision in action which of course is not anywhere to be even imagined. In fact with examples offered by other bishops and holy persons without any remonstration towards them for same by the Church, just the opposite is in order for such a decision. Once again the faithful are being left without grace unnecessarily. Just in case anyone here hasn’t as yet had the time to read those suggested short articles mentioned above I’ve offered a shortened summation here. Now then if anyone should find themselves reflected in that offering it would be of help if your response is not the usual reactive type. It’s very simple – no need for justifying self through any broader strawmen. A simple acknowledgement of the local bishop’s forced acquiescent reality check for proper authority in this matter would suffice! No need for grandiose off topic reference to any larger group beyond the one bishop in question. This is now a matter of fact. Can you accept it yourselves? If not, please at least refrain from any opinion about others who have been proven correct in their own definition of just who has been in charge for quite some time now. Otherwise, being now corrected, that might just show the real disingenuousness in all of your prior arguments and criticisms against same. You will notice that many bishops will not issue statements unless it involves Church property or liturgical activities. I do not believe you will see Mass offered there. People going will end up at area Masses. There is really little a bishop can do when something is not taking place on Church property, other than to grant or withhold permission for the Sacraments. As is proper, I have not allowed Mass to be celebrated or other devotions involving the Blessed Sacrament. This is out of reverence for the Eucharist, the source and summit of the Catholic Faith. Since the visions of Medjugorje are still under investigation relative to their authenticity by the Holy See, I should not give any sign of approval nor associate with events connected with these visions. Among some, these private revelations (if they are valid on that level), are becoming more important than the Revelation of our Lord and Savior, Jesus Christ. That is scandalous. An “unbelieving age seeks after signs”. The demand for “visions” can be a way of putting God to the test. That is very dangerous indeed. I pray that the Church can expeditiously bring order to this continuing challenge. I am Canadian… The U.S. bishops are not “my” bishops. But I love Americans: why would I criticize them? Let’s say that the bishops are members of the Communion of Saints, as you, Rose, and me. The sensus fidelium would permit me to express a respectful critique to another member of the said Communion. But in the case that you submit, I won’t. The mission of Catholic News Service is the mission of the Church itself — to spread the Gospel through contemporary means of communication. In the days to come, I will read the articles in question and will see if I am in the position to verify that the reports are “full, fair and free” and that they have been made professionally. If it is appropriate, and if I have time, I will address my comments to the editorially independent and self-sustaining division of the CNS and leave the U.S. bishops in peace, as you firmly recommend me. I thank you for your interest in the free critical approach of Medjugorje. I wish Bishop Baker of Birmingham would issue a statement on Caritas, the outfit in his diocese that is sponsoring Mary’s “apparition” in a couple of weeks. Sheesh. U.S. bishops’ news service presents two positive articles on Medjugorje. Now, don’t criticize your bishops! I think you hit the nail squarely on the head. The background you provide, and the quotes you have pulled are very helpful. Thus far, the conversation concerning the pastoral side of Medjugorje has discussed one narrow part of the story – that which has to do with followers and “good fruits” to the exclusion of bad fruits. We see people pack a cathedral for Ivan Dragicevic or Marija. They will wait for hours in an uncomfortable pew for the the “main event” which is the “apparition” (which always happens at 6:40pm SAT – Standard Apparition Time). People see that as a “good fruit”. We can only raise the question: Would they have packed the same cathedral had the bishop or cardinal led a Holy Hour with the Exposition of the Blessed Sacrament and Rosary? The Rosary itself appears to be a side show with the “apparition” being the “main attraction”, even though the Church has not declared it to be the Blessed Virgin Mary. The pastoral approach thus far, by those in control in Medjugorje is to protect it – even unto cruel use of visionaries (“the ends justifies the means”). My firmest belief is that those visionaries, when still children and teens, initially wanted this to come to an end (“…3 more days”), but they were exploited. I’ve hoped that if the Church learned anything from Medjugorje, it is that anyone claiming to have visions or private revelations should be subject to a period of silence, without publicity. Well-meaning priests and bishops not wanting to “stifle the spirit” have sometimes been too quick to let things go without considering the consequences. With a period of silence and a prohibition on public appearances, publications, etc., anything authentic will withstand the test of time, and those that are not, will fall by the wayside. If publicity and fame are fueling it, the thing will fizzle out on it’s own in very short time. Since Medjugorje began, it seems that many in the Church hierarchy have lost sight of how apparitions and private revelations have traditionally been handled – with caution and with a mind to protect the faithful from opportunists and from Satan. I still can’t get over the fact that in the whole of the former Yugoslavia, these visionaries are not permitted to have public events on Church property. But bishops in countries on several continents are giving them a platform on which to lend credibility to “apparitions” which have not been deemed worthy of belief yet by the Church. This is not just an offense aimed at the Bishop of Mostar, but at the entire Bosnia & Herzegovina Bishops Conference, and to my mind, that of the Croatian Bishops Conference. The greatest fruits of Medjugorje are the “Three-D’s”: Disorder, Disobedience, and Division. I realize that will not translate the same into other languages, but the point remains the same. I wonder what would happen if one of the visionaries should pass away before the Commission closes? Would a new Commission have to be set up?